A King just wants to have fun! It's Monday in a king's life and laborious kingly duties have made for one irritable monarch. Good thing our fair ruler devotes every other day of the week to kingly delights. Come Tuesday, it's up to his courtiers, you fair players, to pull his highness out of his fumk. Each day left in the week brings different demands - a hunt! A feast! A tourney! A ball! The cunning courtier that can tickle the tyrant's fancy with his or her own grand plan will be in the king's good graces and enjoy a coveted seat on the royal council. 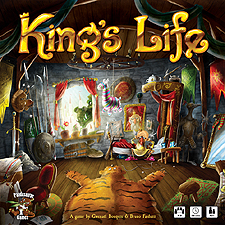 King's Life is a zany game of allinaces and wit by Bruno Faidutti (Citadels, Incan Gold) and Gwenael Bouquin for up to eight eager players - clocking in at just 30 minutes. Enter this wacky world and get lost in the pomp and splendour befitting of only a king!